February 20, 2017 – This week, we mark Presidents Day by putting some serious years and miles on the old DeLorean, starting with a visit to the Tidewater region of Virginia in the mid 1700’s, and ending over 200 years later across the ocean in Hawaii. In between, we’ll make a bunch of stops in Ohio, a handful in New York, and others scattered across the nation. 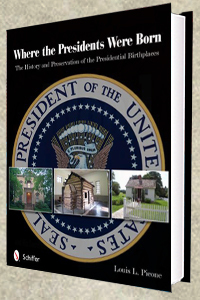 Our guide on this journey is Louis Picone, author of Where the Presidents Were Born: The History & Preservation of the Presidential Birthplaces . From George Washington to Barack Obama, the book shares insights and history of the homes, highways and hospitals of the first 43 men who’ve served as our commander-in-chief. Louis and I are both from the Garden State of New Jersey, we decided to meet up at one of the hidden presidential jewels of the Jersey Shore. It’s the Church of the Presidents in Long Branch where seven commanders-in-chief worshiped, more than anywhere outside the nation’s capital. In a future episode, we’ll visit the chapel (now home to the Long Branch Historical Museum Association) to hear more about Presidents Grant, Hayes, Arthur, Harrison, McKinley, Wilson and Garfield — who passed away right across the street from an assassin’s bullet. We’ll also do a follow-up with Louis on his second book The President is Dead! The Extraordinary Stories of the Presidential Deaths, Final Days, Burials, and Beyond . If love walking in the baby steps of our presidents, check out LouisPicone.com, toss a like to Facebook.com/LouisLPicone, and follow this week’s historian @LouisPicone on Twitter.